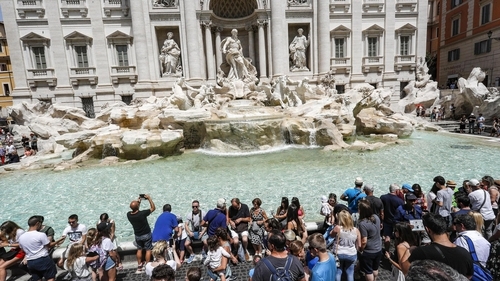 A row has broken out between the mayor of Rome and the Roman Catholic Church over what should happen to coins retrieved from the Trevi Fountain. Every year, nearly €1.5m is fished out of the famous landmark and given to a Catholic charity to help the poor and homeless. However, Mayor of Rome Virginia Raggi now wants the money spent on the city's crumbling infrastructure instead. City councillors have approved the change, which is due to take effect from April. However, the Catholic Church has hit back and the charity Caritas has said that the loss of income will hit the poor. Over €4,000 worth of coins are tossed into the fountain every day. Avvenire, the daily paper produced by the Italian Bishops Conference, launched a scathing attack on the council in its Saturday edition. The paper slammed the move in an article headlined "money taken from the poorest". The tradition of throwing coins into the fountain dictates that if you throw a coin over your shoulder into the fountain, it will bring you good fortune.